Born in Cortez, CO, Francis Livingston has been painting for 30 years. He is in the top ranks of American illustrators, and his work has been widely published. His paintings have been exhibited in San Francisco, Los Angeles, and New York. Francis studied at the Rocky Mountain School of Art in Denver before moving to San Francisco in 1975 to attend the Academy of Art. He later taught there for 10 years. Influenced by Sargent and Whistler, he painted primarily in a monochromatic style until he began to study the work of the Bay Area Figurative Movement, including Richard Diebenkorn, Wayne Thiebaud and others. That led to experiments with color and a fondness for the California and French Impressionists. For nearly twenty years, he has been painting the Santa Cruz boardwalk. “I’d always been intrigued by amusement parks-the rundown seediness, the intermingling of the past and present. When I went down to Santa Cruz for the first time in the 70’s, it had that same quality-the old rides, the colors starting to fade. It fit in with the look I was after.” He has also done numerous portrayals of scenes from New York City and Coney Island, focusing on dramatic architecture and color. Francis lived and worked in San Francisco and San Anselmo for 20 years until he and his family located to the Sun Valley, Idaho area, where he has developed a deeper appreciation for the west. Influenced heavily by painters such as Maynard Dixon and the Taos artists, his paintings of western landscapes and pueblo architecture capture the colors and light effects that are unique to the West. 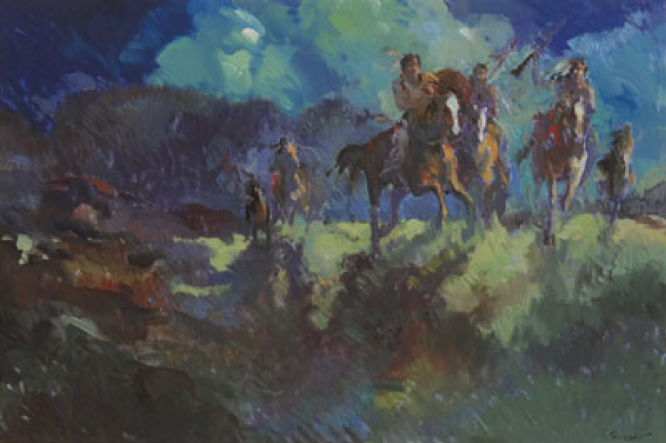 Livingston was commissioned as book cover artist for Academy Award winning author Michael Blake’s Dances with Wolves and The Holy Road. He also was the official artist for the 2004 Kentucky Derby. This article was excerpted from Canyon Road Arts: The Complete Visitors Guide to Arts, Dining and Santa Fe Lifestyle, Vol 1, 2005-2006, page 46. Canyon Road Arts is published by Medicine Man Gallery. All rights reserved.